My friend Tom is MC'ing an event here in Calgary this weekend called GoreGames. It's basically a big Halloween bash with some interesting games like a "bloody t-shirt contest" and whatnot. Not really my thing at all, but Tom is being an angel and promoting my online craft shop by giving away some items I've made and donated to the event. He'll be giving away prizes to the various guys and ghouls for winning the different party games, and he's got 4-5 things just from me to give out! 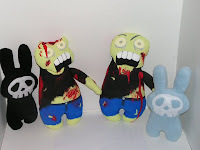 Over the weekend I made 2 hand painted zombie plushies and 2 plush "dead bunnies" with hand sewn skeletal faces as part of my donation to "the cause." The zombies will have my online shop website etched into their backs and the bunnies will come with tags, and Tom will have a whole slew of business cards as well. It's exciting being promoted to a large group at such a big event here in town, and I can't thank Tom enough for the exposure. In related news, the official Calgary Zombie Walk was cancelled and rescheduled for in the spring, but many ghouls took to the streets this past weekend for fun anyway. In a way I'm kinda glad that they'll be doing it officially in the spring... perhaps that will give me enough time to fashion up a big load of mini hand painted zombies to sell cheap at the Walk... once again helping to promote the site and my art. Fun! My list of crafty stuff seems to be dwindling down a bit... I'm still working on a knitted blanket for Lucas' mom for Christmas, even though it's been a week or so since I last did a square. I'm starting to wonder if maybe I should think small and do a pillow or pillow case instead. I should probably make my list of Christmas gifts so I can see how much crafting time I'll need to get everything done. We'll see how it goes!